Where can I store my luggage in Rome? Whether you have a couple of hours before your flight or you just arrived in the Eternal City and are stuck waiting for check-in, you probably asked yourself: Where can I store my luggage near me? Storing your heavy bags is the best way to make the most of your time, without feeling like you’re missing out. After all, no one wants to let a hefty bag get in the way of their day. Worry not, Stasher has got you covered with our handy luggage storage guide to Rome. Stasher has a network of hundreds of luggage storage locations where you can conveniently and affordably store your bags. Dropping your bags with us is easy, secure and fully insured - our StashPoints allow you to safely store your luggage right where you need to. ✔️We partner with international hotel chains of the likes of Premier Inn and Accor hotels. ✔️Stasher has luggage storage locations within walking distance of all main tourist attractions and transport hubs. ✔️Drop off and pick up take less than 3 minutes. ✔️We offer award-winning customer service in multiple languages available 24/7. How much does it cost to store your luggage in Rome? It’s just €5 per day, and €5 for any additional day. Where are the StashPoints for my luggage in Rome? From the Colosseum and the Vatican Museums to Roma Termini and Tiburtina, we’ve got the whole city covered with conveniently located luggage storage facilities. To see all our luggage storage locations in Rome, click here! Most of our StashPoint are open 24/7, 7 days a week. However, we recommend checking before booking online, especially during bank holidays. Storing with Stasher takes less than 3 minutes! Check for opening times and walking distance from your preferred location. Select drop-off and pick-up times so that the host will be ready to welcome you. Don’t know how to spend your last day in Rome? Check out our handy guide to the Top 10 Hidden Gems in Rome! There are other luggage storage services available in Rome so that you won’t end up carrying your luggage through the entire city. If you’re transiting through Termini and Tiburtina train stations, there are some options available for you. Where can I find luggage storage near Roma Termini Station? Hotel Agorà is just one minute walk from Termini station and open 24/7. Follow the link to make a booking. Hotel California, conveniently located next to the train station. No queue and easy pricing. Book here. Gallery Souvenir, perfect for storage if you are visiting Monti or Piazza della Repubblica 5 mins walk from Termini. Open late. Opening hours vary, we recommend checking the individual luggage storage location before making a booking. €5 per day per item. Roma Termini is Rome’s main train station, connecting the capital with Florence, Venice, Milan and Naples. If you want to do some sightseeing, take the Linea B metro line. You can get to the Colosseum, Fontana di Trevi, Piazza di Spagna and more in less than 15 minutes. For more info regarding services available at the train station, check out their official website. Where can I find luggage storage near Roma Tiburtina Station? There are two facilities offering luggage storage near Roma Tiburtina, making it easy for you to drop your bags and enjoy everything the city has to offer. Eco Store Via L. Il Magnifico, conveniently located near the train and coach station. Eco Store, managed by the same owner but on the other side of the station. Wherever you are, there’s a StashPoint on hand. Opening hours vary, we recommend checking here before making a booking. Low-cost coach companies such as Flixbus depart from Tiburtina Coach and Train Station. Connected to the rest of the city through Line B, the first underground line build in Rome. The Colosseum is only 5 stop away! Where can I store my luggage near the Colosseum? Wheely Bike Rental, less than a 5-minute wak from the Colosseum. Open 7 days a week, 9am - 6pm. Starbike, conveniently located if you’re arriving/leaving from Colosseum station. Opening hours vary, we recommend checking before making a booking online. It’s 5€ per day, and 5€ for any additional day. The Colosseum is only two stops from Termini train station. Take Linea B, the Blue Line, of the Rome Metro to the Colosseum station. 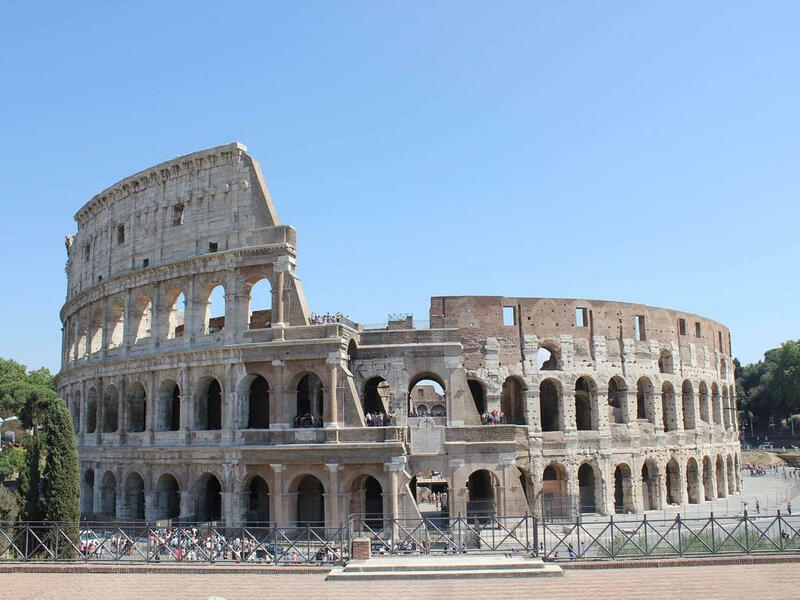 You can explore the Colosseum on your own or take a guided tour. The admission ticket price is €12. Audio tours cost €17.50. You can buy them here.